NVIDIA announced their latest GTX 690 graphics cards earlier in the week, and now MSI has announced their new GeForce GTX 690 graphics card which comes with dual GeForce GTX 600 GPUs with 3072 CUDA Cores and 4GB/512bits GDDR5 memory. World-renowned graphics card and mainboard manufacturer, Micro-Star International (MSI), officially launches the most powerful graphics card–GeForce GTX 690, adopting dual GeForce GTX 600 GPUs with 3072 CUDA Cores and 4GB/512bits GDDR5 memory. NVIDIA GPU Boost technology allows the core clock to be automatically adjusted on the fly for optimal in-game performance. When used with the MSI Afterburner overclocking utility, the power limit and clock offset can be adjusted as well for better overclocking capability. A single card can also support NVIDIA 3DVision Surround technology for up to four monitors to give gamers the best in-game experience. MSI GeForce GTX 690 is the best choice for the enthusiast gamers. 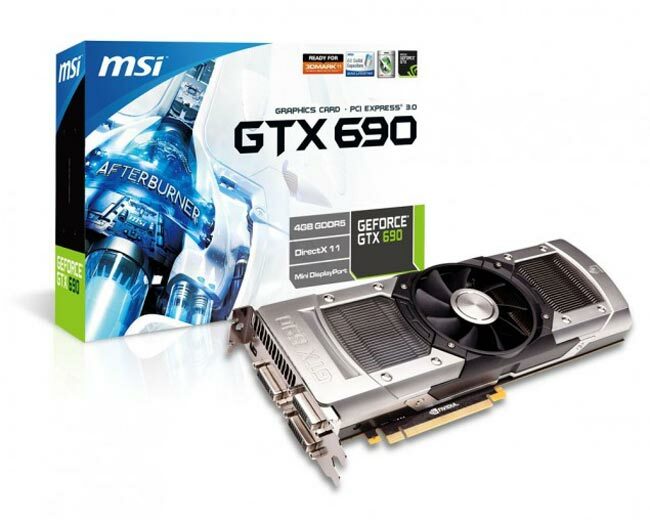 You can find out more details about the new MSO GeForce GTX 690 graphics card over at MSI, there are no details on pricing as yet.